Detective Al Warner deals with a diverse group of people on a daily basis in Miami. Nothing surprises him anymore as to people’s criminal behavior. In “The Prom Dress Killer” by George A. Bernstein the newest serial killer is looking for an old flame from high school that stood him up on the prom. Over the course of several years, he is determined to find her and find out why. The problem is though he can remember her auburn hair, height and body type, he can’t recall her face. Although Warner is a detective extraordinaire, he is baffled by this killer who leaves no clues and seems to always be one step ahead of the homicide division. The race is on to find this maniac before he strikes again. The plot was quite different in this story in that the killer spent so many years looking for this disappearing prom date, and took such care in plotting how to avoid detection. The killer even finds a way to take his latest victim directly from a hospital where she is under the protection of heavily guarded police. One area that seemed to baffle me was the last victim appeared to be quite resilient throughout all of this. Given my experience working with victims, it seems they need long-term therapy in dealing with PTSD. There were many situations where I felt the potential victims were quite naïve, not being careful where they went or whom they trusted when in isolated environments. Bernstein has an excellent writing style in that he keeps the suspense going and has you thinking to yourself, “Don’t trust this person.” Each time you think you know how to stop this killer something happens to throw you off, keeping you engaged and intrigued as to how things will turn out. I liked that the author built the characters slowly and presented the motive of the killer in such a way that it wasn’t revealed too early. 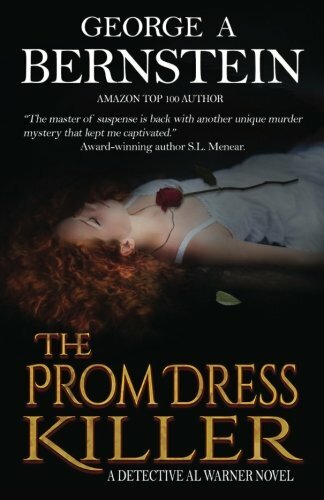 For those who love a great mystery full of twists and suspense, I recommend “The Prom Dress Killer” by George A. Bernstein.